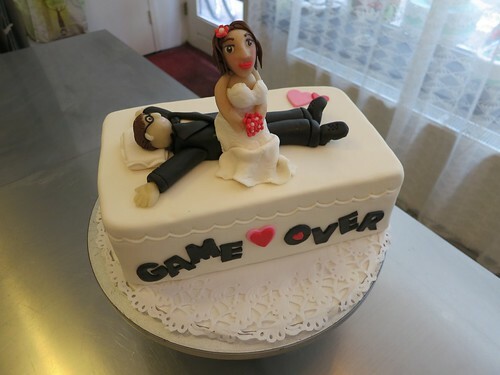 GAME OVER bachelorette party cake, a photo by CAKE Amsterdam - Cakes by ZOBOT on Flickr. Bachelorette Party Cake with figures on top made in the likeness of the Bride and Groom. Hilarious! The cake was inspired by a design that the client found on internet. FLAVOR : Chocolate Cake with Rich Chocolate Gananche and raspberries.